Some days I wake up and feel energized, driven and ready to go, and other days not so much. However, what really sets me up for an unproductive, negative day is when I’m not even sure what I want or why I’m doing anything. This sometimes leads to stagnation and unhealthy habits, like eating Thai chips and zoning out with Netflix. In the short term, I’m satisfied I can put things off until tomorrow, but in the long term this is harmful behavior. In a study that linked lower mortality to having a sense of purpose in life, data was included on more than 136,000 participants who were mostly Japanese and American. The data shows that, “the US studies evaluated a sense of purpose or meaning in life, or ‘usefulness to others.’ The Japanese studies assessed the concept of ikigai, translated ‘as a life worth living’.” What a difference between cultures. So, how can you find your Ikigai? Start with asking yourself a few questions. -What was the last compliment you received? -What is something you have a ton of knowledge about? -Is there something that comes natural to you? -What kind of news do you read/watch? What articles stand out to you? -Is there some trauma in your own life that others could relate to? -What organizations or charities interest you? -If you could spend an entire day doing whatever you want (money, location, etc. don’t matter) what would you do? -What do you do for fun on weekends or when you’re not working? -When was the last time you felt joy? What were you doing? –What are you dong when you feel most motivated? -What is something you’ve always wanted to learn? -What are you doing when you lose track of time? Don’t assume after asking these questions that answering them will suddenly bring some kind of light bulb over the head revelation. Just as we all evolve throughout life (take a look at your outfit from 10 years ago) you must be patient in finding your Ikigai. Most types of self help concepts give us a quick fix and tools to become our best selves right this second. 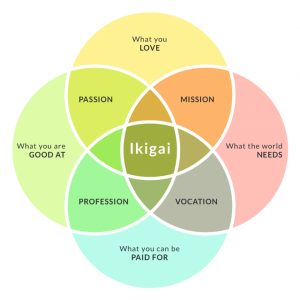 But, that is not what Ikigai is about. Finding your life purpose is no quick thing, it’s a process. Just the idea of working towards finding your Ikigai can be enough to get you going in the morning. Focusing too much on external validations will take away from your internal focus, your path. Finding your Ikigai takes huge amounts of internal reflection and connecting with the sounds of the universe will help you hear your own inner voice. In order to find your Ikigai, you need to be in tune with all of your senses and the world around you. Stop rushing in your life and in the pursuit of Ikigai. Give life a chance to unfold for you rather than trying to force everything. Trying to be perfect or talking down to yourself will only block you from finding your purpose.